Rebranding Israel: Will Netanyahu get away with it? Israeli Prime Minister Netanyahu, a master of Zionist double-speak and deception, is about to undertake the most important assignment of his life. Because of its continuing occupation and oppression of the Palestinians (not to mention on-going property and land grabs), Israel is becoming a pariah state so far as a growing number of the citizens of nations are concerned. The main purpose of Netanyahu’s forthcoming trip to America is to .launch a public relations campaign to rebrand Israel in the hope of stopping the rot of its growing isolation. The highlights of this campaign launch will be a meeting with President Obama on 20 May; an address to AIPAC’s annual convention the following day; and, the climax, a speech to a joint session of Congress on 24 May. When he meets with Obama, I imagine Netanyahu will say something very like the following: “Mr. President, you have demonstrated the strength of your commitment to fighting and winning the war against terrorism by bringing your policy into line with ours on the matter of targeted assassinations.” (I also imagine that Netanyahu has given Mossad the greenlight to liquidate Hamas leaders). 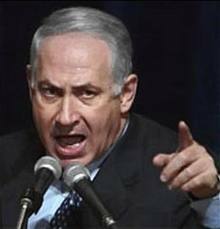 With most Republicans who run for election to Congress now as willing as most Democrats to speak from Zionism’s script in order to secure Zionist lobby organized campaign funds and votes, it can be taken for granted that the applause Netanyahu will receive in Congress for his propaganda nonsense will match that he’ll get at AIIPAC’s convention. The truth can be simply stated. On matters to do with Israel-Palestine, it is not the Congress of the United States of America. It’s the Congress of Zionism and its deluded Christian fundamentalist allies. So the name of Netanyahu’s game will be, as ever, to blame the Palestinians for the failure to get a peace process going and to present Israel as the only party seriously interested in peace. The timing of Mitchell’s resignation is not without interest. I thought the BBC’s Kim Ghattas reporting from Washington was probably about right in her analysis (my emphasis added). “Mr Mitchell is said to be resigning for personal reasons. He is 77 and the travelling has probably taken a toll. But if Mr Mitchell had sensed that success was within reach, it’s unlikely he would be quitting his job. The timing is also interesting: an indication the policy disagreement had reached an impasse. Mr Obama is expected to make a speech about his Middle East strategy next week. Mr Mitchell was in favour of a more hands-on approach, maybe even pushing to put a detailed US peace plan on the table”. From reading between the lines of recent reports in the New York Times, I think it is possible to identify the particular step back Obama has taken and which probably did cause Mitchell to resign. In my reading of Obama that makes a lot of sense. He knows that it’s not in America’s own best interests to go on supporting Israel right or wrong. He knows that he ought to be putting an American peace plan on the table and challenging Netanyahu and the Zionist lobby and its stooges in Congress to reject it. But he also knows that would be political suicide for himself and many other Democrats who’ll be running for re-election next year. On 24 April there was an editorial in the New York Times with the headline President Obama and the Peace Process. It’s opening paragraph was this. “President Obama began his presidency vowing to negotiate an Israeli-Palestinian peace. He backed off in the face of both sides’ obstinacy and after a series of diplomatic missteps. Since then, the stalemate, and the mistrust, have only deepened, and it is clear that nothing good will happen until the United States fully engages.” (My emphasis added). The U.S. is not going to fully engage. Only bad things can come out of Netanyahu’s visit to America. And I mean bad things for all of us, everywhere. Middle East Fellowship of So. Calif. Outstanding analysis, Alan. For the next few days we’ll have to brace against a lot of nasty pro-Israel propaganda filling our screens. And yet … Perhaps Mr. Netanyahu might score some success in the U.S. with his “public relations campaign to rebrand Israel”, but certainly not in the rest of the world. Which might not mean a lot at this point in time. Of course you are right in stating - elsewhere in your articles and interviews - that ultimately only Washington and it’s ‘Zionist’ Congress can force Israel into complying with International Law. And that looks like a Mission Impossible right now. But watching the support for Palestine accelerating everywhere, I’m somewhat confident that in the long run world-wide outrage will rise to the point that Washington – and other Western powers – can no longer ignore it. And it may happen even before American citizens will finally stand up to fight for their rights and those of the Palestinian People, so closely connected. But right now, as you say, we’ll witness a lot more ‘bad things’ coming out of Netanyahu’s visit to America. I just watched Obama’s live speech on the ‘Arab World’ – to me it totally confirmed Washington’s unwillingness ‘to fully engage’. I hope I’m wrong – perhaps I was expecting a miracle and missed possible tiny breakthroughs – which would not be sufficient anyway to shake the Zionist rulers’ self-confidence. I am writing to say thank you for your dedication to your subject and the contribution of "Zionism" I,like many others, have a knowledge of the word, but not of its far flung intricities and effect on our government and the world, which is thoroughly explained in your writings. Your post of 5/10 I thought brilliant and brought many things to light. I'm 78 and while I was thinking of this post, the next one of 5/16 was here. And by now we know the outcome of Netanyahu's visit. As predicted the outrage for "poor Israel" begins. I already checked, UN Resolution 242 is on debate. Again, Job security for the law makers, always leaving room for discourse. I just finished reading "Web of Debt" by Ellen Brown,J.D. Her explanation of "Banking" is very helpful for the layman to comprhend basically how we of the US. and many countries have been manipulated into financial meltdown. Also on the web you can download a 3,1/2 hour documentary,"The Money Masters". Combining this knowledge of who is manipulating who , should make your next post very challenging. I found two sites that may help. The first one I hope is seen by every American. Our American Government. http://www.texemarrs.com/102009/zionist_jews_in_power.htm Just copy these and paste directly into address bar. creating CD'S for the cause and of recent I purchased two addressing the subect of Zionism. I naturally compare them to your standards and found them a good supplement. So your efforts are prevailing. Good post. Readers who are seeking confirmation of what you wrote would not go far amiss were they to read the recently released 'Al Jazeera Transparency Files' - these being usually verbatim records or full summaries of the now stalled Palestinian-Israeli peace talk. you are doing a work of paramount importance by showing to the world the true side of history...the media have contributed a lot to the bloodbath that is still going on in the Middle East by conditioning the people to believe in a version of history that is not true...you are doing a very great work in telling us what really goes on, mostly in your books. When will the Arab spring reach Jordan? The Palestinian majority is oppressed under the tiny minority of the Hashemite king. We could have a Palestinian state today ruled by the majority in Jordan today if the international community were to start pressing on the subject and force King Abdullah of Jordan to turn the state into a democracy with one man one vote! Israel is starting to reap what it has sowed - what does it expect? I just like the valuable info you supply to your articles. I will bookmark your blog and take a look at again here regularly. I am moderately certain I'll be told plenty of new stuff right here! is sharing information, that's actually excellent, keep up writing.